There is nothing more person-centered than having the opportunity to map out your own future and be in control of your own life. While the move to self-direction can seem overwhelming, there are many resources out there to help with the process. In the Driver’s Seat believes that Self-Directed Services offer people with developmental disabilities and their families the opportunity to map out their future and be in control of their own lives. They provide tools and resources for individuals and families to effectively navigate and utilize self-directed services to put them in the Driver’s Seat. 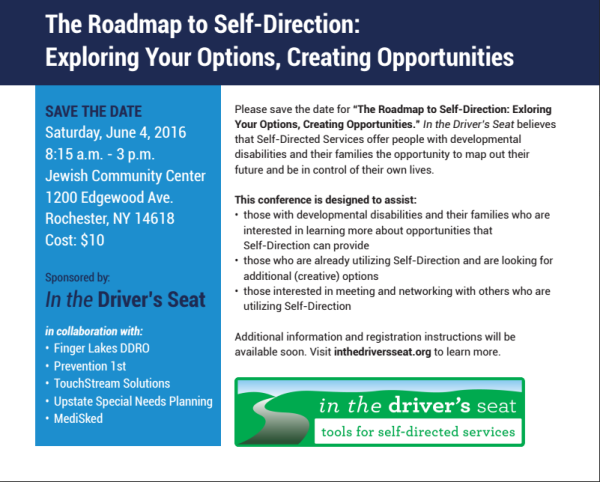 The Roadmap to Self-Direction: Exploring Your Options, Creating Opportunities - Happening This Saturday! New York is interested in helping people with intellectual and developmental disabilities and their families live more independently - and this weekend there's a conference happening to highlight the State's efforts and educate people on the possibilities, so that anyone who wants to can make it happen. The name of the conference is "The Roadmap to Self-Direction: Exploring Your Options, Creating Opportunities" and it's all about Self-Direction, the model of care that gives participants the decision-making authority and allows them to manage their own supports and services with help where needed.